My son-in-law has a Windows PC and uses Outlook. He now has both an iPad and an iPhone. He wants to sync the calendars in the two Apple products with Outlook on the PC. Can that be done? 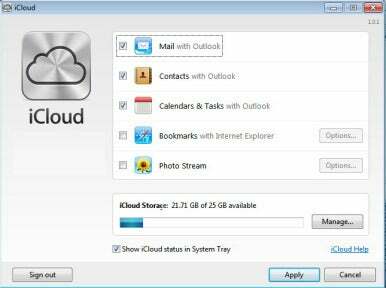 It can and will be done via Apple’s iCloud Control Panel for Windows (Windows Vista SP2 or Windows 7 or later required). Install this control panel on the Windows PC and access it via this path: Start Menu -> Control Panels -> iCloud. You’ll see options to sync mail, contacts, calendars and tasks, bookmarks, and Photo Stream. Mail, contacts, calendars, and tasks are synced with Outlook (Outlook 2007 or later required). Bookmarks can be synced with Safari (5.1.1 or later) or Internet Explorer (IE 8 or later). Launch the control panel and enter your Apple ID and password and click Sign In. Select the items you want to sync with iCloud and then choose whether to sync all items of a particular type (all events and contacts, for example) or just a selection of these items. The data will then be synced with iCloud. Any content synced currently with iCloud will be added to Outlook. And existing Outlook data will be added to iCloud. Look under the My Calendars heading and you’ll see entries for all of your iCloud calendars. Near the top of the Outlook window is a new Refresh iCloud button, which does exactly that when you click on it.